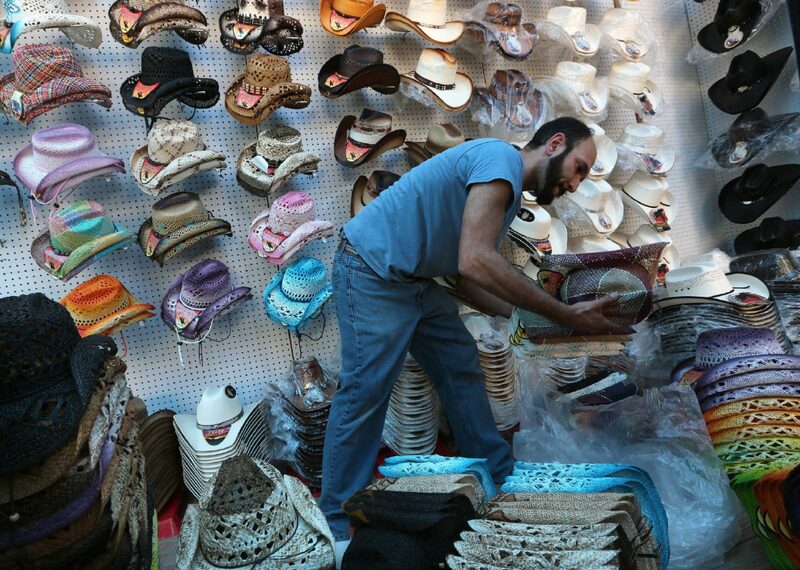 Julian Palacios sorts through a pile of hats while deciding which ones to display on the wall of his booth while preparing for the Rio Grande Valley Livestock Show Wednesday, March 7, 2018, in Mercedes. Palacios' company, based out of Harlingen, makes the hats in Mexico and normally distributes them wholesale, but likes to make a retail booth annually at the stock show. It’s that time of year again when residents and visitors alike kick up their heels at the Rio Grande Valley Livestock Show and Rodeo in Mercedes. Located at 1000 N. Texas Blvd. 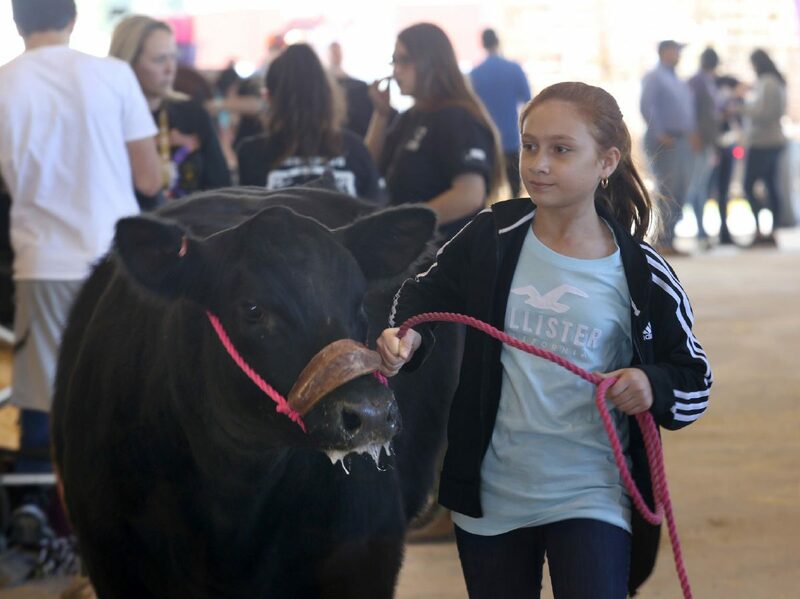 in Mercedes, about 3,000 students exhibitors from school districts across the Rio Grande Valley will show animals they’ve raised from chickens to cattle. The 79th annual event also features horticulture production and art. Students earn scholarships and awards — an average of $1.6 million each year, according to a news release. The 11-day long livestock show starts at 8:30 a.m. Thursday with the judging of junior Santa Gertrudis — a breed of cattle commonly raised on the King Ranch. The judging of market steers will take place at 7 a.m. March 16 in the event center arena. 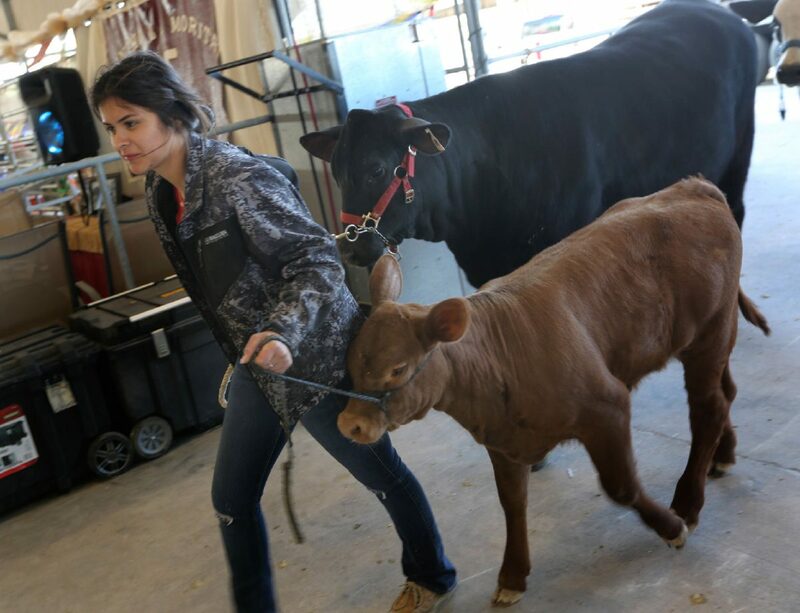 Nathaly Flores, 17, leads a calf named Olivia, front, and Autumn into the barn while preparing for the Rio Grande Valley Livestock Show Wednesday, March 7, 2018, in Mercedes. Flores is a member of La Joya FFA. 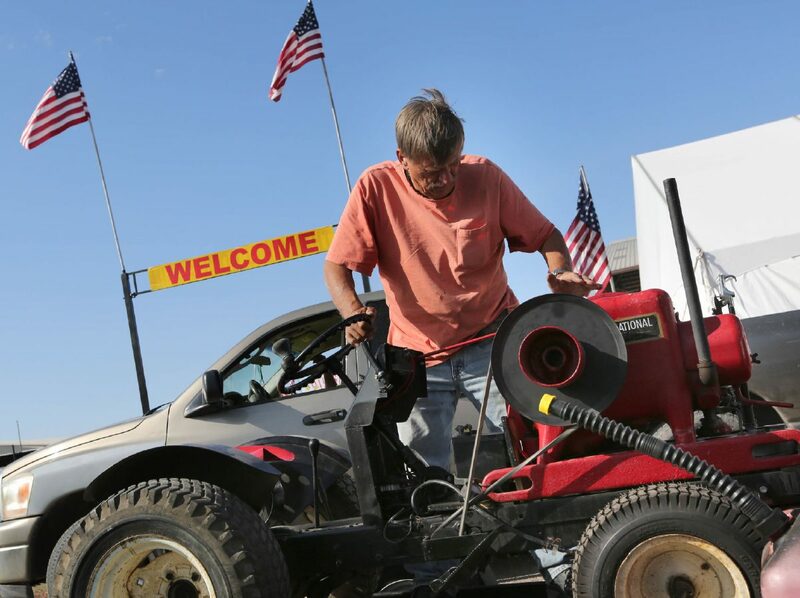 Lyle Jaegler starts a 1945 motor to run an old riding lawn mower while setting up the antique farm machinery area at the Rio Grande Valley Livestock Show Wednesday, March 7, 2018, in Mercedes. Natalee Alvarez, 11, leads one of San Isidro FFA's cows into the show barn while getting ready for the Rio Grande Valley Livestock Show Wednesday, March 7, 2018, in Mercedes. In addition to the judging of livestock raised by students, the livestock show will feature an exotic petting zoo, steer roping, various exhibits, carnival, and live music from Duelo, Chris Marshall, Lauren Corzine, Sunny Sweeney, Jon Wolfe, Cory Morrow, the Spazmatics, Zane Williams and others. The norteno group Duelo will perform at the Payne Auto Group Rodeo Arena with Jaime y Los Chamacos at 7 p.m. Friday. This year’s parade, a widely attended event, features the theme “Educating Youth, Promoting Agriculture,”and will begin at the corner of Texas Avenue and Sixth Street and travel down to Starr Street in Mercedes. Floats, marching bands, horse riders and others will proceed down the route at 10 a.m. Saturday. The first place float by a nonprofit group will win $1,000 with second, third and fourth place also receiving monetary awards. The annual PRCA Xtreme Bullriding rodeo event will take place at 7:30 p.m. Wednesday with tickets starting at $10. The thousands who are predicted to walk through the entrance gates can also enjoy a funnel cake, attend one of the many kid friendly events like the kiddie karnival or watch the popular greased pig scramble. For a full list of events visit www.rgvls.com.